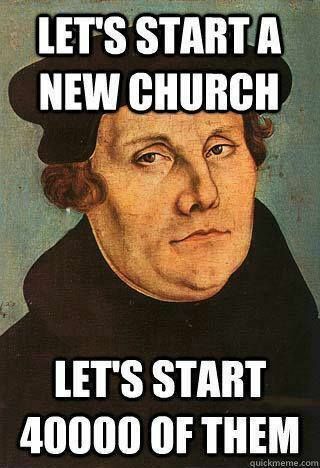 The protestant reformation in the year 1517 was just one of literally thousands of times that some christians decided to make up their own version of christianity. So, Pete Buttigieg, openly gay mayor of South Bend, Indian has been in the news a lot. First for being an openly gay public official announcing his intention to run for president, then by raising enough money (fairly quickly) to qualify for the first Democratic Candidates’ Debate, then by kissing his husband on the campaign trail (which didn’t hurt his standing in the polls), then by refusing to back down on criticism of the blatant homophobia of Vice President Mike Pence, then by officially announcing his candidacy (and having his husband on stage, where there was another kiss while the crowd cheered). Last I counted, we have about 18 officially announced candidates, and the first primaries and caucuses are still ten months away, so it is way too early to know if Mayor Pete is going to wind up being the nominee. But all the media attention and his success so far as sure gotten some of the religious right into a tizzy: Christian College President Everett Piper Slams Pete Buttigieg’s Faith and ‘Proclivities’. I’m not going to link to Everett Piper’s full commentary (published in the Washington Times—a small far-right newspaper not to be confused with the prestigious Washington Post), but the article above has a link, and it’s not hard to find. The title of Piper’s commentary is: “Pete Buttigieg doesn’t get to make up his own Christianity.” And that’s just hilarious! Because Piper is a member of the Weslyan Methodist Church (and is the president of a Weslyan Methodist college), which is a denomination that form in 1843 when it split off from the Methodist Episcopal Church, which officially split from the Church of England in 1784, which was formed in 1534 with King Henry VIII split with the Roman Catholic Church. And each of those splits were over doctrinal differences (yes, there was a specific personal and political aim that Henry was going for, but it was over a doctrinal dispute about what would constitute reasons for annulling a marriage). That means that each of those splits was because someone decided to make up their own version of christianity. Mayor Pete is a member of the Episcopal Church, an American denomination that is part of the Anglican Communion. And the Episcopal Church has been accepting of gay and lesbian members, priests, and bishops for some years now. Mayor Pete wasn’t even one of the movers and shakers in that regard, so you can’t even accuse him of having made that particular doctrinal change. Piper’s denomination, while being a splinter from a splinter of the Anglican Communion, has far more in common with fundamentalist evangelical denominations such as the Southern Baptists, than the Episcopal Church. And many of those fundamentalist evangelical denominations which Piper considers to be practicing his version of christianity are descended from groups that split from the Roman Catholic Church back in the year 1517, after Martin Luther nailed 95 theses (proposals for reforms) to the door of his church. Each of the thousands of denominations are the result of someone deciding to make up their own version of christianity. If Piper is going to insist that no one has the right to do that, he darn well better resign from his current church and go join the Roman Catholic Church. Of course, if anyone confronted Piper about this, he would quickly deflect, because the real issue is that Piper and his co-religionists don’t think that denominations such as the Episcopalians are “real christians.” But he doesn’t want to admit that. Instead, he tries to cast this as somehow it is Mayor Pete all by himself deciding that queer people can be out and non-celibate and be good christians at the same time. The fact that christian denominations such as the Episcopalians, the United Church of Christ, and the Presbyterians, welcome and affirm queer members is something Piper and his ilk want to ignore. Just as they keep pretending that it is only a minority of the U.S. population that favors marriage equality and civil rights protections for queer people. And what really worries them is the growing support in almost all denominations, especially among younger christians, for full acceptance of and legal equality for gay, lesbian, bi, transgender, et cetera people. Because it’s just another reason why many of those unwelcoming denominations are seeing the membership shrinking. Of course, I’m not the only person to observe this: Why do right wing Christians find Pete Buttigieg so threatening? Here’s the answer — The attacks on the South Bend mayor from severe fundamentalists will surely continue in the months ahead. If you want to know more about Mayor Pete and his candidacy for president: Who is Pete Buttigieg? Meet the gay millennial mayor surging in the Democratic primary. I don’t have the timeline, but I highly suspect that it probably occurred around the same time Reagan said the Times was his favorite paper. I guess where I’m going is speaking of how far these right wing churches will bend the concept of acceptable “Christians”, so long as it aligns with some of their politics, as it does with how easily they will reject other churches. Yep! It’s hypocrites and bigots all the way down!